This issue has caused me grief on several servers this week and I finally figured it out... so now you benefit. I really doesn't matter what you specify as you "Source" the Prerequisites Powershell command we all love will fail. So if you do searches you will come across others having this issue. They solved it by running. Which would help... but there is one last key piece of information I'll give you... which is the point of this blog because I found the answer in a comment on an obscure blog post. If KB2966827 or its brother KB2966828 are installed the dism command will fail to install about 67% of the way in. Not surprisingly the work around is to uninstall either of those two KBs... or to do your Prerequisites before you run Windows Update. Update: Couple of things, Microsoft provided another update KB3005628 that will supposedly go in and take care of the issue, so you don't have to uninstall the above KBs. However, I never got around to testing it because it seems like as of now, a fully patched 2012 R2 box only needs the dism command above executed against a mounted ISO (or burned DVD). IT WILL NOT WORK pointed to c:\Windows\WinSXS directory. I do not know if this is the case with Server 2012 (R1). But hopefully there is enough in this blog post for you to work through it if you find yourself in that predicament. There you go... my pain is your gain. Enjoy. For at least a couple years now my employer has been on a constant search for talent to deploy Microsoft Lync and the components that are part of that ecosystem. But it is getting harder to find guys that will fit in with the company culture and have a good set of fundamental skills (or phenomenal skills if we get lucky). So I thought I'd write a post, from my perspective, about what some of the skills are that it takes to work as a consultant in this Microsoft Unified Communications world. Engineers and Architects that can do this type of work WELL are a rare find. They posses knowledge from multiple disciplines (data, voice, server apps, security etc) and combine them all to help a customer deploy a solution that fits their needs. My hope is that this will finally convince some people that are on the fence to jump in (and increase the pool of talent). ... and no you don't have to be an Architect to jump in, you can start out being an Engineer or working the support desk. You can learn as you go. Here is the bottom line... the more of these the better. The more of these you are excellent at... the better consultant or support engineer you'll be for your customer. Nobody... Nobody will be an expert at all of these. But sometimes the secret is knowing others that are experts in that area... or knowing where/how to find the answers. If you are weak in most these areas... no problem... go buy a computer, create a lab of your own and pick something and start to learn. With Microsoft based software there is usually no lack of freely available knowledge you can learn from and there are certainly plenty of books out there on all of these topics. Don't expect you will learn all of this in two weeks. I've been gathering knowledge for as far back as 20+ years and that knowledge still applies to what I do today. But everyone has to start somewhere. This one is all on you. My unique path took me from being a network manager/admin at a University, to working 11 years for Nortel and then combining all that experience into what I do now. Some of this is hard to learn in a lab unless you are loaded with money. You need to surround yourself with people that know about the skills you need to work on. This is where the networking (the people kind) really comes in handy. Go to some industry conferences. Get on twitter and follow people that tweet about the things you want to learn about. Get on LinkedIn and make some connections and join some discussion groups. I'll keep updating this as I think of things... but bottom line is that this stuff isn't easy, but it is something that is able to be learned given enough time and effort. Customer was running the AlwaysOn scenario with Centralized Logging Service on Lync Server 2013. The drive was filling up with .etl files when we had set the "CacheFileLocalMaxDiskUsage". When I observed how this was operating on a working system, I noticed as soon as the .etl file rolled over to a new one (at 20MB), it would be converted to a .cache and .hdr file and the .etl file would be deleted. So clearly the issue was the .etl files not being converted and then deleted. This allowed a huge amount of disk space to be chewed up and for disk alerts to be sent by the customers monitoring application. This will be an obvious one, but it still may catch people, so that is why I'm putting this blog together. The culprit was Symantec Antivirus. Once this was disabled the .etl files were converted to .cache and .hdr files as expected. The centralized logging service should have been excluded per the Technet article about excluding executables and directories for Lync Server 2013 (http://technet.microsoft.com/en-us/library/dn440138.aspx). Ran into this problem a while ago and just now getting around to writing about it... but it is one of those head scratch kind of problems, until you compare a working system with the non-working system. In this case, I spotted the problem of Desktop/Application Sharing across the Lync Edge server in Wireshark when the client went to STUN the server on port 443. I didn't realize this, but there actually is a momentary TLS negotiation on 443 STUN and the failure from the AT&T Hosted Firewall looked like this. From the Lync Edge server perspective everything was successful. But the AT&T Hosted Firewall in the middle of the TLS negotiation was sending back this "Level: Fatal, Description: Access Denied" error instead of what the Lync Edge Server responded with. This was both an issue for Lync Server 2010 and 2013. The jist of the resolution was to request AT&T to do a Policy Bypass for the IP Addresses associated with the Lync Edge server. The problem was with STUN, but I would probably ask they bypass any other IPs if you have multiple IP addresses on your Lync Edge servers. Just in case that doesn't get you far enough... I have below verbatim what was send back... so that you can coax the Level 1 support technician to find someone that really knows what they are doing (my cust went through several support people before he found someone that could fix this). Next meeting of the Colorado Unified Communications User Group is all about bringing back some goodness from the Microsoft Exchange Conference (MEC)! We are excited to have Jason Sherry (Exchange MVP) come talk to us about Exchange migrations! "Exchange cross forest migrations: Free or 3rd party tools?" is the title and this session will cover the steps required to migrate from one Exchange 2000 or higher forest to Exchange 2010/2013 in another forest. A high-level outline of the steps, scripts, Microsoft tools, and notes from the fields will be discussed. Discussion will cover the scripts included with Exchange 2010 and 2013 to migrate mailboxes across forest and how to migrate contacts, groups, policies, and many other settings that aren’t migrated by those scripts. 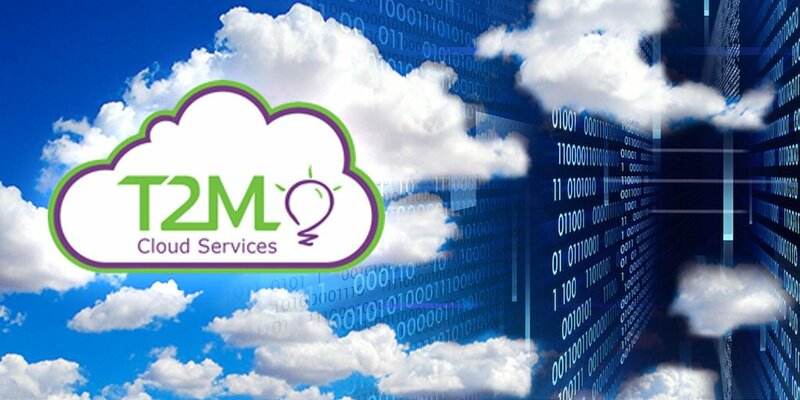 The main focus will be the many additional steps, solutions, and scripts required to do a full fidelity migration. This session will not go into detail on Forefront Identity Manager and 3rd party solutions; however the use of them will be discussed. This session will mainly focus on the needs of small to medium companies (< 3,000s of mailboxes). Information discussed will be helpful to any size organization that needs to do a cross forest migration. We are also super excited to announce that ENow will be sponsoring this months meeting and we will get to hear from them about their tools inconjuction with Exchange and Hybrid solutions. If you haven't seen their products, check them out or follow them on Twitter: @ENowConsulting. We hope that you will join us on May 29th from 4-6pm for this great session. Also... I have another great #ucoms Update deck... you won't want to miss this one! The meeting will be held at the Microsoft office in the Denver Tech Center. While I was researching how to deal with Forms Based Authentication from a script perspective, for my Audiocodes backup script(s), I stumbled upon Chocolatey. Chocolatey NuGet (love the name) is a Machine Package Manager similar to what RPMs are for Linux. This allows crazy simple install and uninstall of software from PowerShell... silently. Anyway... you get the idea... now go have some fun! Did you miss Lync Conference 2014 because it sold out? Couldn't get the boss to spring for a trip to Vegas? Well, not to worry, the Colorado Unified Communications User Group has you covered. We are pleased to announce the Best of Lync Conference 2014 - Denver! On April 24th, from 9am-1pm, we will be hosting sessions that are based on the content that was delivered at the Lync Conference in Vegas. I will be presenting the Technical Deep Dive for Lync-Skype Video. 9:30-10:00am - "Our Story - New Belgium Brewing"
Video – What in the World are You Doing to My Network? We would like to thank our sponsors for their support. We will have food and giveaways thanks to Jabra, AudioCodes and Clarity Connect! The event will be held at the Microsoft office in the Denver Tech Center. Busylight has released a new BETA driver for their ever popular USB device. Busylight now has visual and audio alerts available for IMs, Second call rerouting treatment, Definable Hotkeys for call handling and the ability to switch on the PC monitor when you receive a call. Most of the new functionality is available in a new dialog box called Lync Tools. The IM Alert functions and Lync Tools are available as a right-click to the systray icon. Here is where you can find the new BETA drivers... enjoy! Update: Blogger lost my original Tuesday update (maybe on purpose... haha), so I added those pictures back, but the text will obviously be different. @patrichard: #TheUCArchitects are giving away over $50,000 in products and services at #LyncConf14. See http://t.co/WKOHgX2LRx for details on how to win. 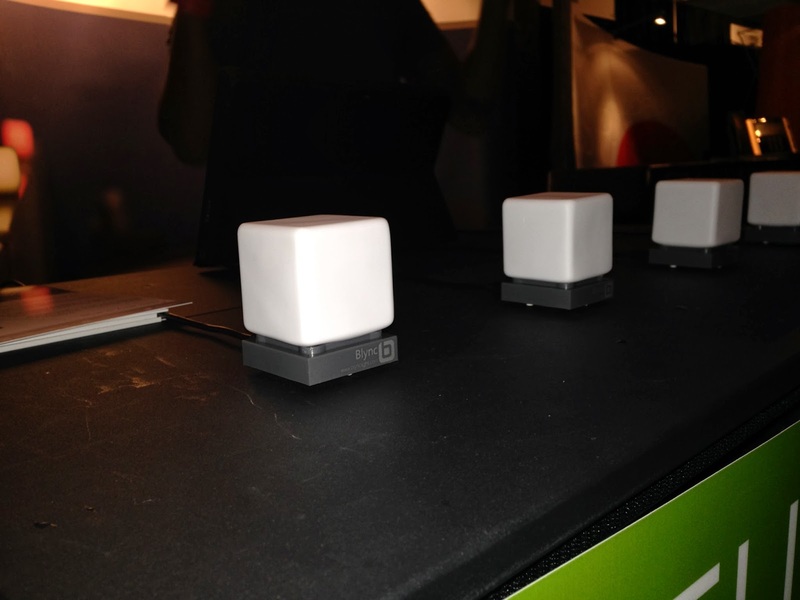 BlyncLight was showing off their Presence cube device. These connect via USB and let others know visually from a distance what your presence is. These seem to be well thought out, especially for a cubical environment where these can sit up on top of the partition. @BlyncLight sent me a message back indicating they are 1.77 inches across. Vytru remote that works similar to a Wii remote for controlling their Video Conferencing Lync client (think Lync Room System like). This device doesn't have to be pointed at the screen, and knows where it is in space so it is very easy to control the pointer on the screen and run a conference from across the room. They also have touch based devices they can demo... Check out their booth. Conference Exhibition floor was absolutely huge for 2013. These two pictures are of one single row of exhibitors. There are around 6 rows of Exhibitors with various sizes of booths. Obviously this is a beautiful puck like speaker phone. I wasn't able to actually hear it in action, but it will obviously have the Sennheiser attention to quality when it comes to producing sound. Even though the Speakerphone has one mic, it is setup in such a way to be omni-directional. They also claim that the mic will pick up audio from a much greater distance than similar competitors. This Speakerphone is capable of actually performing well is a real conference room. The Speakerphone comes in two flavors. One has just a USB connection and another has the USB connection and an additional audio cable that can go straight in to a device that does not have a USB/Lync. One other thing is that the device has a battery inside that automatically changes when connected to USB. Sennheiser also was showing off a Bluetooth headset. The headset can go for 10 hours of talk time. Has 3 noise canceling microphones and WindSafe technology. If you look at the picture closely the silver portion of the headset slides to easily turn on and off the headset. They also have a number of different configurations for the ear. They have a hard case that keeps track of the headset and USB dongle. But I will make a note that this case does not charge the headset in case any Plantronics Voyager Legend fans are reading. Back when I worked on OCS 2007 R2 and was deploying the Enterprise Voice with Dual Forking (Nortel). I encountered many customers that couldn't do the Dual Forking kind of deployment, but didn't want to go full tilt with OCS/Lync either. One solution that would have been great is if you could just do Presence integration with an existing PBX phone. Enter Verapresence with their VeraSync product. They have built a product that takes place of the Cisco CUPS server or works with the Avaya AES server. They change a users presence even if they simply pick up the handset even before they are on a call. So, if you are wanting to integrate Lync with your PBX, but you don't want to deal with RCC or Enterprise Voice, this might be what you are looking for. There were a lot of parties at the Lync Conference this year, but the main Attendee party was at Hakkassan Night Club in the MGM Grand. Was a pretty wild party... but I heard this was actually pretty tame compared to what they normally can be in this night club. Anyway... Thanks to Microsoft and Perficient for throwing a great party. 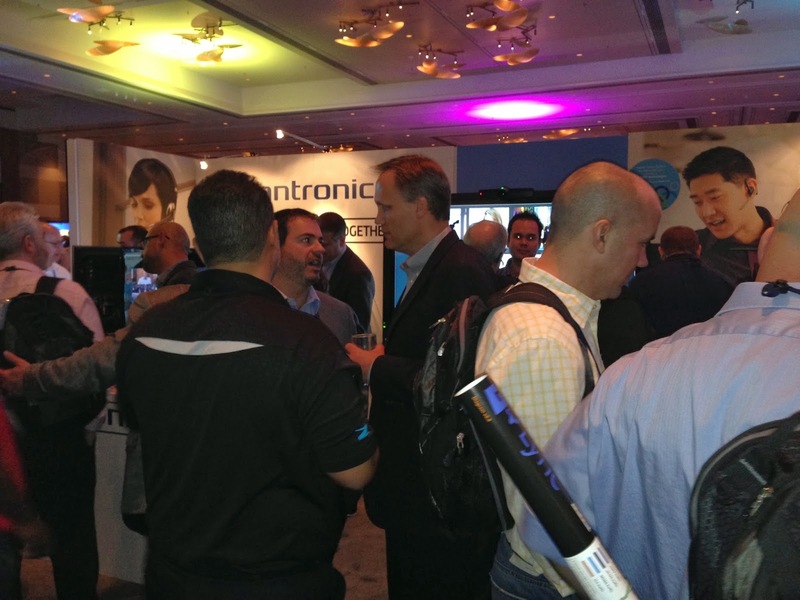 Logitech was one of the more popular booths at the Lync Conference 2014. It actually took me until Thursday to get close. I was not disappointed. Logitech was showing off their ConferenceCam CC3000e. For 999.99 retail price you get a 5X Optical, and an additional 5X Digital zoom PTZ camera and conferencing system. The camera itself has a 90 degree field of view, which isn't bad... and it comes with a remote that can control the different features of the camera. Most notable is that the Camera does the Video DSP processing and takes the load off of the PC which can be problematic for Conference Room PCs. Below is the audio speakerphone for the Logitech ConferenceCam CC3000e. Along with working with Lync through the USB hub in the upper left hand corner of the screen and down below, it is also Bluetooth enabled. 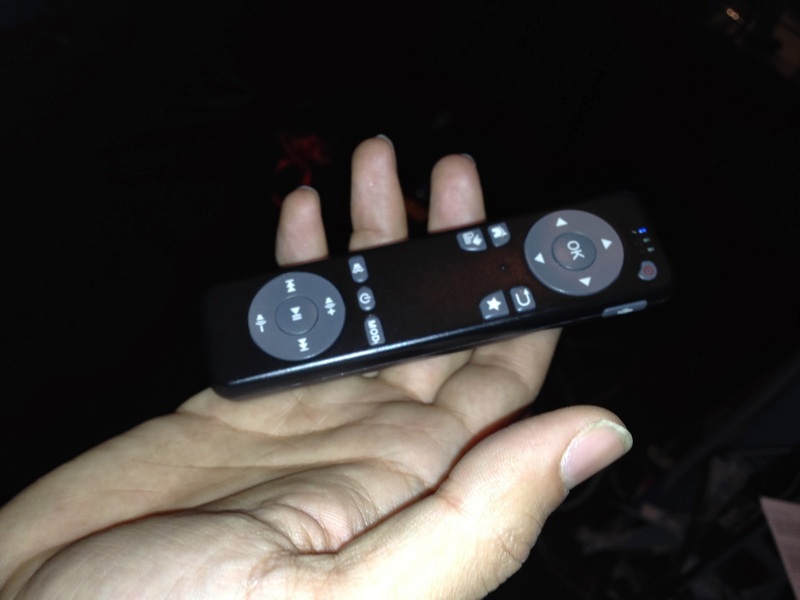 Logitech ConferenceCam CC3000e Remote pictured below. Along with camera controls for Pan, Tilt, Zoom it also has answer and goodbye dedicated buttons, and other audio controls. This is the USB hub that connects the Camera and Speakerphone together. Below Logitech is entering in to the personal speakerphone market. Notable difference is that this speaker phone has a place to stand up your smart phone. What appears to be a dock... is really just a place to rest your phone. No actual smartphone dock exists and it does not charge your phone. Logitech also was displaying their DECT based headsets. The H820e headsets come in single and dual ear piece configurations (mono and stereo). They also came across as quite well made. To answer or hang up a call, there is a button at the back of the mic boom. There is also a LED light to indicate the status of the user. The mute button is on the boom and not easily spotted. UnifiedCommunications.com was in full force at the Lync Conference. One item they were showing off was their Device portal that they can deploy for a customer. This can be fully customized with the devices a particular customer is wanting their users to order from, but it also has a Device selection wizard that asks a number of questions to continually narrow down the devices a user needs. The questions... and how the wizard flows can be full customized. This device portal can be deployed for free if a customer acquires devices through UnifiedCommunications.com or for a fee if they want to acquire their devices from another distributor. 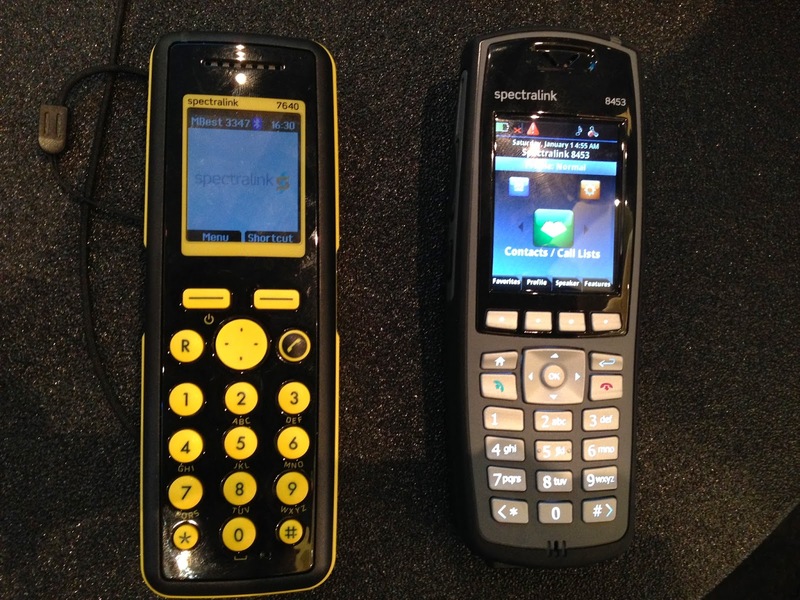 Spectralink was showing off some phones. This is their first show where they have not been part of the Polycom family. The phone on the left is a DECT based phone. The phone on the right is a Wi-Fi based phone. They have MANY more phone choices (durable, and bar code scanners etc) and even an android based phone. These pictured below are just a couple. 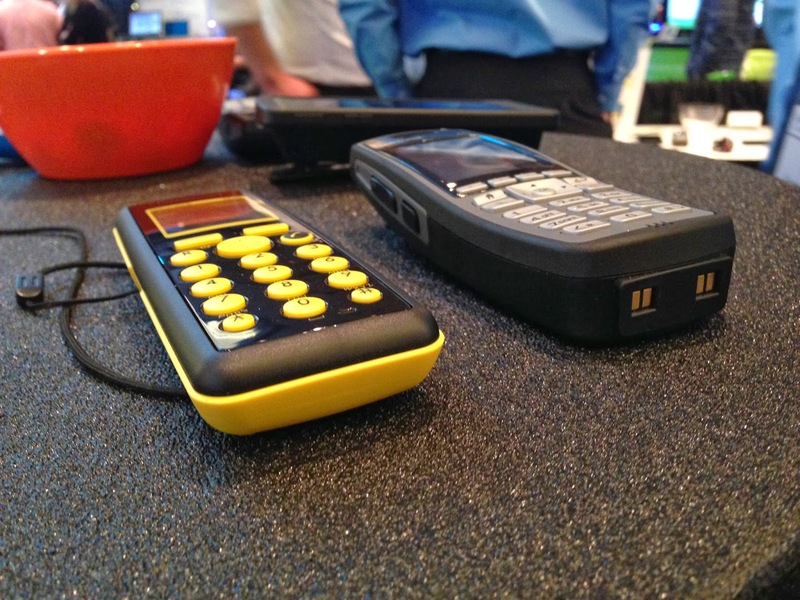 Both of these phones are fairly durable and have been tested to go in to harsh environments. The DECT based phone actually registers to an access point pictured below. 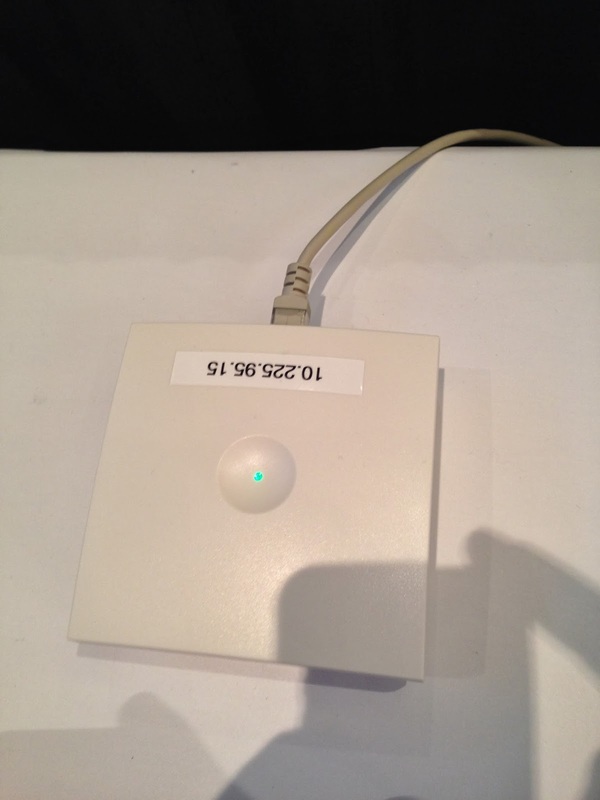 The access point takes care of registering to Lync. Although the user doesn't have access to search contacts or address book, the access point takes care of changing the users presence to "In a Call" when a call is made. The Wi-Fi based phone gives a more Lync like experience. The user can search contacts, and address books, change presence etc. This is the DECT based access point. Not much to it, but as mentioned above the DECT handsets register to this Access Point and it in turns takes care of the registration to Lync.